What an incredible woman! Wow! I have just been reading up about Martha Stewart and I am bowled over. She is this week’s Game-Changer and I can quite see why. Not being American, I did still know of her but not the full extent , not by any stretch. Her name for me was synonymous with being the quintessential homemaker but I see that her talents are endless. You should read up about her yourself as hers is such an amazing success story. The fact that she actually was found guilty on several counts in March 2004 and spent 5 months in jail, then came out and continued going from strength to strength all points to her being one formidable woman.When I read that in May 1995 New York magazine had her on their cover as ‘the definitive American woman of our time’, I thought to myself that I should find a recipe that was American through and through. I saw that her many cookbooks seemed to be mostly about baking: cakes, cookies and desserts and the idea of cupcakes came into my head. However I would probably find those difficult to take over to Daughter No 2 tomorrow if I gave them a fabulous swirl of a topping so then I thought of cookies. And to me American cookies means either chocolate chip or peanut butter. Since I have already got my own choc chip cookie recipe, and since a peanut butter cookie recipe was staring me in the face, I thought yes the perfect choice! You can’t get much more American than that, I thought! Next, the peanut butter. Now, this is not something that is regularly eaten here – as you can imagine in this land of olives and white cheese! It’s available but it’s disgusting as it is SWEET. I knew however that I had a jar of SunPat at the back of my larder ( Son Cem had brought it back from NY one time) – but was it crunchy? I ran to the kitchen to have a look and lo and behold it was! So my choice was sealed: Martha Stewart’s Peanut Butter Cookies it was! · Preheat oven to 350°F/180°C. 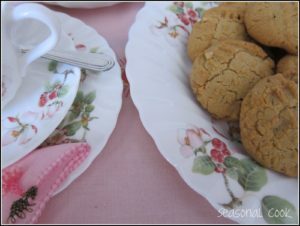 · In a medium bowl, put the flour and baking powder; set aside. 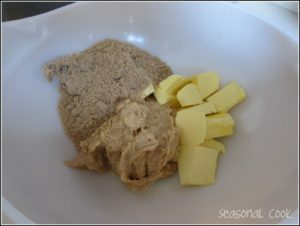 · In a large bowl, beat peanut butter, sugar, and butter until smooth. Beat in egg. Gradually add flour mixture, beating to combine. · Pinch off dough by the tablespoon; roll into balls. Place 2 inches/5cm apart on parchment-lined baking sheets. Using a fork, press balls in a crisscross pattern, flattening to a ½ in thickness. 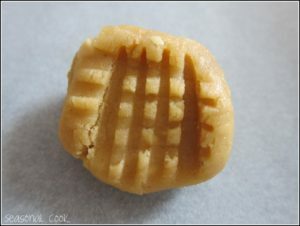 · Bake cookies, rotating halfway through, until lightly golden, 18-22 mins. Cool cookies on a wire rack. Store in an airtight container at room temperature up to 1 week. I do realise that many of you probably make these with your eyes closed but I was very pleased with them! BTW I only got 24 out of this mixture and I don’t think they are unduly big. I hope you are enjoying this as much as we are! See you next Friday for the next Woman Game-Changer in Food! You're absolutely right – there's nothing more American than peanut butter! Thanks for the great recipe. She is really amazing and so are your yummy cookies!!!Kisses,dear! HHmmmmmm yummy! 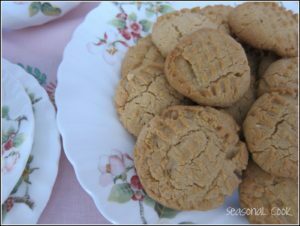 Peanut butter cookies…. baking it makes my home smells fantastic! They are so addictive! I don't actually like peanut butter but tried peanut butter cookies once, made by a friend and really loved them. I guess you could cut down on th sugar if you use the peanut butter we have here? Actually I could just have eaten that peanut butter straight out of the jar and foregone the cookies! MMm I had forgotten how absolutely the stuff is!! I thought of Nigella too but she doesn't have the homemaker talents that Martha has. No, I couldn't think of anyone in the UK who can match MS.
Ayak: yes I think if you cut down on the sugar, it would surely work. thanks everybody, for your lovely comments! 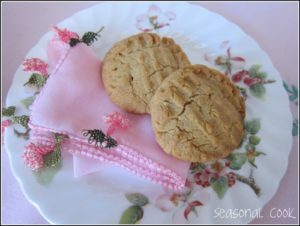 Peanut butter cookies are absolutely a favorite of mine! And they are for sure American through and through. What a great choice! You have made one of the all time favorite cookies here in America. I have been traveling for the last 3 weeks on a motorcyle trip with my Turkish friend Tulin. She and I have gone with our husbands to Alaska and the Pacific NW. I love her cooking and hope to go to Turkey with her next year. Or the next. Thanks for your kind words. Wonderful! Thank you so much for posting this! I LOVE peanut butter cookies but I haven't made them in I don't know how long because every recipe I've found calls for Crisco, this weird lard thing you get in America. I hate that stuff, and thought I was destined to never eat peanut butter cookies in Turkey until today! Yahooooo! I'm bookmarking this for the weekend! Thank you, everybody!I'm glad they are as American as I think they are! Gosh, Penny, that sounds adventurous! You must let me know if and when you come! Hi Barbara! I remember that name Crisco from some time in my childhood when we lived in LA. What is it???? You know, I'm not at all sure I know what lard is either. Happy baking!